In November 2017, Asialaw Profiles (ALP), an internationally renowned legal rating agency, published the guides for the recommended law firms in Asia-Pacific in 2018. Chang Tsi & Partners was recognized as one of the Highly Recommended Firms in Intellectual Property. From 2006 up to 2017, Chang Tsi & Partners has been recognized as a highly recommended firm for more than ten years. Asialaw Profiles commits to providing legal advice and services in the Asia-Pacific region for corporate executives, in-house counsel and other professionals. ALP, together with Managing IP, is affiliated with Euromoney Institutional Investor. The ranking results this year are based on in-depth research and analysis of law firms in 24 jurisdictions, covering 18 practice areas. 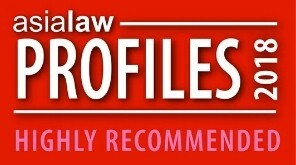 Thus, the law firms and lawyers recommended by ALP are acknowledged by practitioners and clients. Meanwhile, Asialaw Profiles has also announced individual awards. Simon Tsi, Spring Chang and David Lee of Chang Tsi & Partners were among the lists: Simon Tsi was awarded Mark-leading Lawyer in Intellectual Property, Dispute Resolution, and Company Law; Spring Chang was awarded Market-leading Lawyer in Intellectual Property, and David Lee was awarded Leading Lawyer in Intellectual Property.